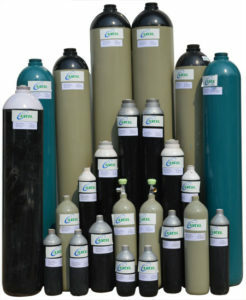 We, Axcel gases along with our associated companies are a renowned Ethane Gas supplier and distributers in India. Ethane is a chemical compound which is highly flammable, non toxic, non corrosive, colorless and odorless gas in its pure form. It has got a boiling point of -88.5o C. Ethane is mainly a natural gas which is available under earth and under sea bed. Major source of Ethane are Natural oil & gas fields and gets generated during petroleum refining. Ethane is separated from Methane and Propane using different cryogenic distillation techniques and during the process pure Ethane gets separated from other components by liquefying it. Ethane is available in different purity grades and concentrations to meet the specific requirement of diverse industries. Ethane is majorly used as a source of energy for various applications. Our experienced professionals can use their knowledge to provide you solution to fulfill your unique requirements. As a refrigerant in cryogenic refrigeration systems. As a Fuel gas in automobiles. As a fuel gas in gas generators. In production of Vinyl Chloride. In Production of Acetic Acid. As a calibration gas mixture when mixed with any inert carrier gas, to check and calibrate the laboratory or research grade instruments. These are some of the common uses of Ethane. There are various other ways in which Ethane can be used in a particular industry or process.